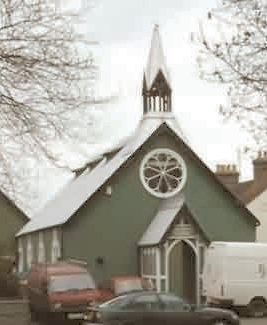 The Tin Church, formerly St Saviour's Church, stands at the corner of Whitstable Road and Cyprus Road, opposite the Recreation Ground. Built in 1885 it was originally a daughter of St Mary of Charity (Faversham Parish Church). At a time of rapid population growth and new housing to the east of the town centre, it was intended to cater for the needs of people living in the Cyprus Road and Park Road areas. Deconsecrated in the 1950s it was then used by nearby Faversham District School, a Church of England primary school, for activities such as country dancing. The church was later sold by the C of E and successively became a shop, print works and joinery, and then a private house. The building is now The Hot Tin, a café and social events venue, as well as remaining a private dwelling. It retains the name St Saviour’s Church for postal use. Tin churches (also known as tin tabernacles) were mass-produced Victorian structures made of corrugated galvanised iron sheets coated with zinc and assembled around a wooden frame, all prefabricated. At a time of large-scale population movement and increase, some 4,000 such churches were built from the 1850s to serve new communities; they were chiefly Anglican, but also Methodist, Baptist and Roman Catholic. Manufactured in the UK, they were exported across the British Empire, including to Australia and Canada. Churches were of varying size and sophistication, from little more than a large shed to substantial buildings. Faversham’s was one of the latter; a good size church with associated rooms, a porch and small bell-tower with spire. The Tin Church is Grade II listed.